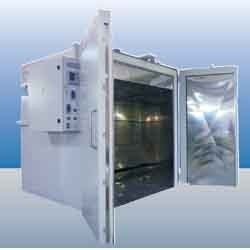 Our organization is an eminent name, which is engaged in delivering Process Dryer to the respectable clients. The offered range of process dryers is manufactured using premium grade components, sourced from dependable vendors of the market. We have gained a reputable image in the industry due to our qualitative heavy duty industrial equipments imbibed with customer centric method of working. We offers a variable range of our products such as Industrial Machinery, Heat Exchangers, Storage Tanks, Industrial Agitator, Pressure Vessels, Material Handling Equipment, Belt Conveyors & Screw Conveyors. We are well equipped with all state of the-art manufacturing facilities that help us to fabricate corrosion resistant industrial machinery equipment, that meet the qualitative as well as quantitative requirements of our clients’. We guarantee our products by performing quality test before dispatching them.